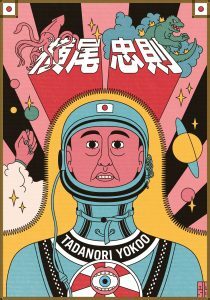 Tadanori Yooko is one of Japan’s most highly recognized graphic designers and artist. He was originally trained as a painter and worked as a stage designer for a Tokyo based Avante Garde theatre. Tadanoori’s work was often very personal, reflecting his own personal interests. Beginning his graphic design career in the early 1960s, Tadanoori incorporated both eastern and western styles into his work to reflect a collective of Japanese society at the time. 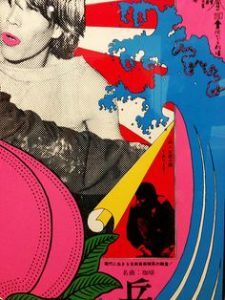 Tadanoori’s early work was heavily influenced by ukiyo-e style and the flat colours of pop art; which he incorporated with photography. Because of the major influence of pop art in his work at the time, many referred to him as the “Japanese Andy Warhol”. Towards the late 1960s and early 1970s, Tadanoori grew interest in Indian culture and Bhuddism, incorporated many religious and universal images in his work. 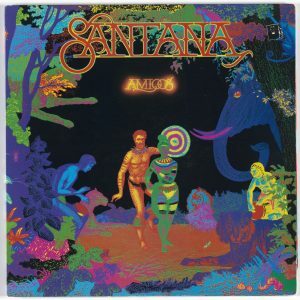 He designed many album covers for rock and folk musicians who he became acquainted with through his “spiritual quest”; including the Beatles, Emerson, Lake and Palmers, Carlos Santanas and Cat Stevens. In the 1990s, Tadanoori began incorporating digital design in his work. He even went through his old work and reworked them digitally. A large exhibition of Tadanoori’s work was held in 1998 with over forty thousand in attendance over a thirteen day period. Tadanoori retired working commercially in 1981. Tadanoori’s work is high personal, even in his commercial work. He incorporates his own personal themes, photographs and references his own anti-modernist style in his work, making it immediately recognizable. His work often teeters between fine art and design, having no limitations or rules in his work, with inspiration from Japan aesthetics, psychedelics, science fiction and spiritualism. Jim Fitzpatrick was an Irish artist whose work included very intricate illustrations, inspired by Celtic methodology; however, his one very famous piece stands apart from his usual artwork he produced. His poster “Viva Che” released in 1968, and has been known as one of the top 10 most iconic images. Jim Fitzpatrick idolized Guevara and the artist had met Che Guevara himself in 1962 while working at bar. When Fitzpatrick heard of Guevara’s death in Bolivia, he outlined the image of Guevara that was taken by Korda (Fidel Castro’s official photographer) using a process called “line drop” and put the image above a red background. Creating a monotone image with only red and black as the main colors, he drew the star in yellow with a felt-tip pen. The poster became an iconic image of the anti-Vietnamese war protests worldwide and used by many. In an interview, Jim states that his artwork “Viva che” was making a statement of outrage at the murder of Che Guevara, a Cuban revolutionist and to keep his memory. 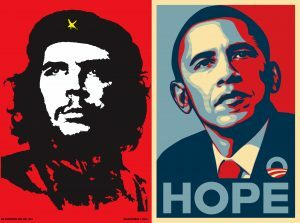 Barack Obama’s “HOPE” poster designed by Shepard Fairey in 2008 for Obama’s presidential campaign is another very famous piece of political artwork used by many of his supporters and became the primary image for the campaign. Like Fitzpatrick’s poster, Fairey has only the face as the focal point to create an impact of a solitary figure with only three colors. Fairey however, added singular words as promise or hope in the poster. Barton, Laura. November 2008. The Guardian. 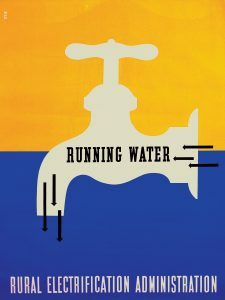 <https://www.theguardian.com/artanddesign/2008/nov/10/barackobama-usa>. 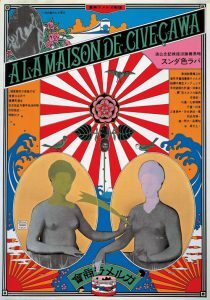 Tadanori Yokoo is a Japanese graphic designer that came up during the avant-garde era of Japan in the 1960s. He is often compared to Andy Warhol with his bright, pop art like designs (Shiner, “Tadanori Yokoo in Conversation with Eric Shiner.”). He is one of the most famous Eastern-Asian graphic designers and has not only influenced the Japanese graphic design scene but also the American. 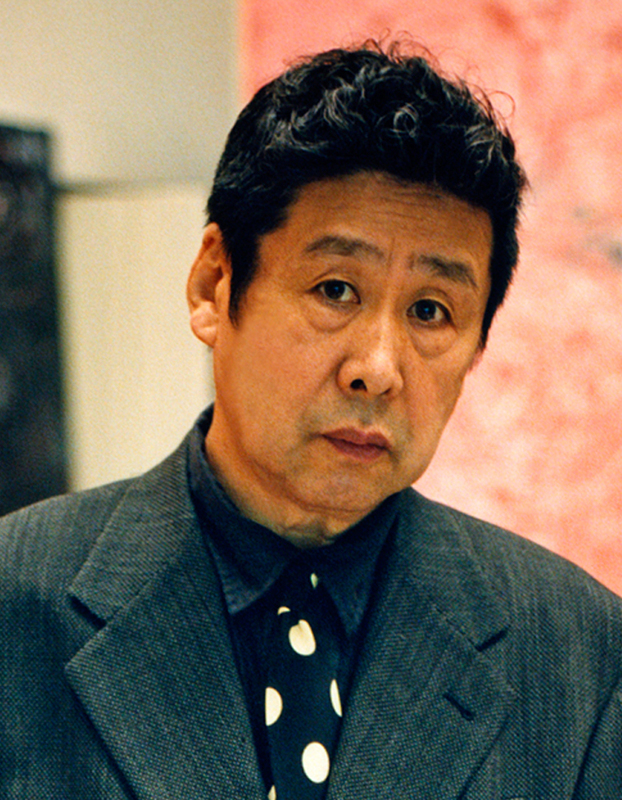 Tadanori Yokoo was adopted and raised in an urban Japan setting by an elderly couple. His adoptive parents owned a kimono fabric making company (Corkill, “Tadanori Yokoo: An Artist by Design.”). He had always been interested in drawing as a child and throughout his adolescence naturally gravitated towards graphic design. During his childhood he would copy images and often drew historical characters that he saw in books (Corkill, “Tadanori Yokoo: An Artist by Design.”). His graphic designs where very much inspired by the traditional patterns of the kimonos and he incorporated many of the traditional art and designs of Japan in his work. Many of his graphic designs also showcase images of children’s card games that were played a lot before the war (Corkill, “Tadanori Yokoo: An Artist by Design.”). In many ways he went against modernism with the type of graphic designs he created. Modernism at the time was the most popular and focused on simplicity and function of a design (Corkill, “Tadanori Yokoo: An Artist by Design.”). This made him unique compared to other designers and lead to many works for filmmakers and playwrights. 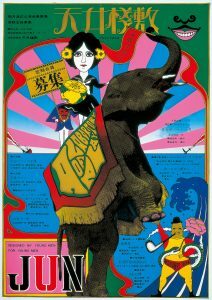 Yokoo was also taking inspiration from western graphic design and began mixing those elements with his tradition and decorative Japanese elements. His work began to welcome psychedelic and pop art elements. 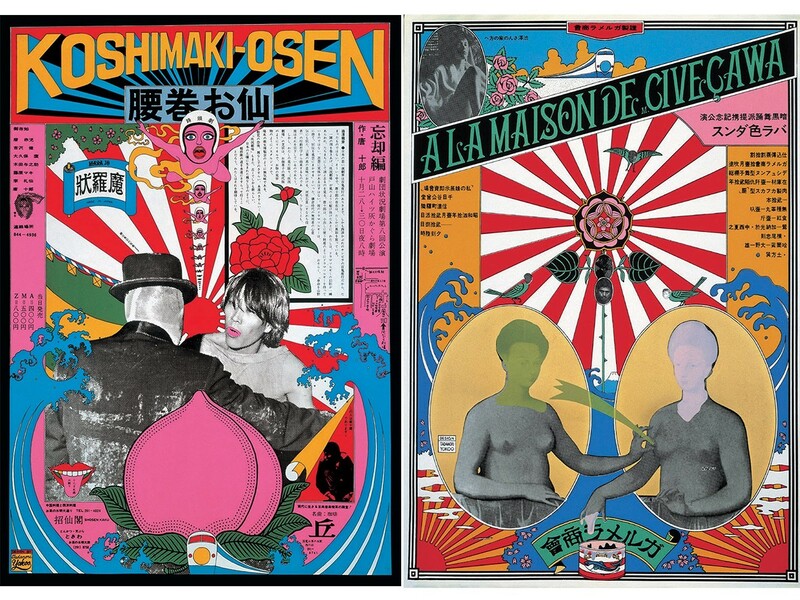 Transitioning him into a style that dubbed him as “The Japanese Warhol” (Shiner, “Tadanori Yokoo in Conversation with Eric Shiner.”). He broke into the American graphic design scene and became a very well known and praised graphic designer; creating designs for albums, posters, magazine covers and advertisements. His perfectly blended style of western and eastern design left him a unique and influential artist. 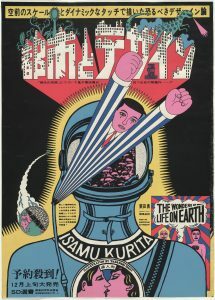 He had been praised and gained critical acclaim (Shiner, “Tadanori Yokoo in Conversation with Eric Shiner.”). Yokoo would be a great addition to the textbook. It is almost shocking that he isn’t. He is such a well known and influential designer, even in western culture. He has done a lot of work in America and joined the inner circles of top graphic designers. It was even in America where he decided to go from graphic design into fine art and decided to showcase his exhibition in New York. With such great influence and prevalence in graphic design and art, he should definitely be talked about when discussing graphic design history. 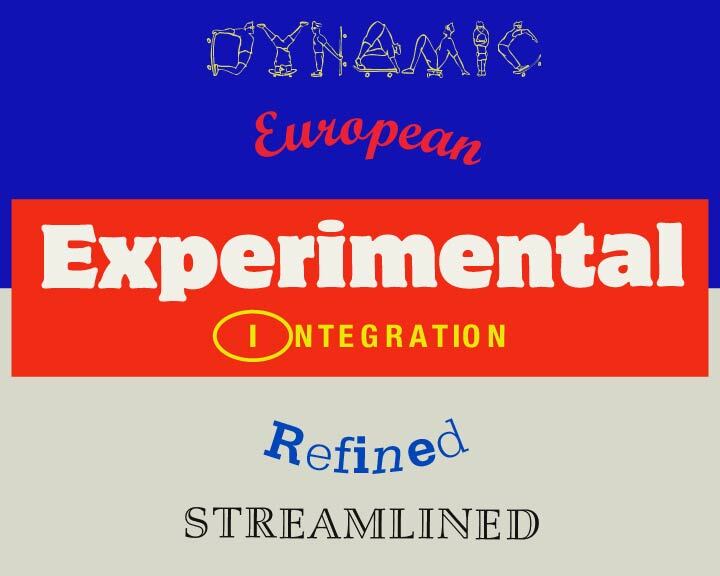 The textbook’s focus is supposed to be about the history of graphic design, but it mostly focuses of the western and European graphic design culture and scene. It would be much better if the textbook would add more eastern designers to expand the book and showcase a more accurate history of graphic design though a global view. Corkill, Edan. “Tadanori Yokoo: An Artist by Design.” The Japan Times, www.japantimes.co.jp/life/2011/08/07/people/an-artist-by-design/#.XKeGCJhyrZs. Shiner, Eric. “Tadanori Yokoo in Conversation with Eric Shiner.” Whitewall, 12 May 2017, www.whitewall.art/art/tadanori-yokoo-in-conversation-with-eric-shiner. 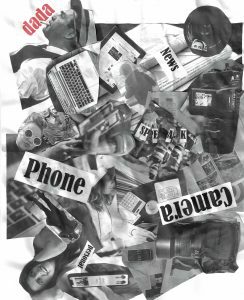 This poster uses the photo-montage collage style of Dada artists like Hannah Hoch and John Heartfield. It uses random cutouts from photographs placed in a nonsensical and chaotic way. Using these random fragmented photos to create a narrative the talks of society’s invasion of personal life through screens. 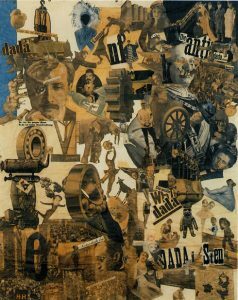 Inspired by Hannah Hoch, Cut with a Kitchen Knife Dada through the last Weimar Beer-Belly Cultural Epoch of Germany, 1919-20. Eskilson, Stephan F. “Sachplakat, The First World War, and Dada.” Graphic Design: A New History, Second ed., Yale University Press, 2007, pp. 133–139. (Larmes) Glass Tears, Man Ray, 1932. Paris, France. Dadaism. Gelatin Silver Print. Representation, synthetic, dramatic, conceptual, emotive, cinematic. Man ray uses an image of a woman who looks very 90’s cinematic which was published after which is said to be the break up of Man ray and his lover, Lee Miller. The woman in the image is showing a lot different emotions from the placement of the ‘glass tears,’ the upward glance of the woman and the makeup. 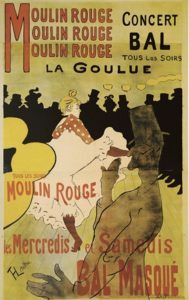 For French Art Nouveau I chose the poster from Henri de Toulouse-Lautrec La Goulue. I find that this poster represents the 6 words that I chose the best. I find in it a modern lifestyle that was expressed in this movement. 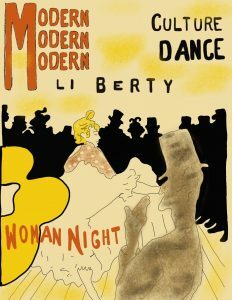 There is a lot of liberty by representing a night life and by the movements in the dancing. It represents a nigh lifestyle and culture. Creative synthesis is a term that describes how the experience of one sense links to another experience with a different sense. An example I’m most familiar is when creative synthesis describes people who see colours when listening to music. Many of these people unsurprisingly are musicians, or creative types. In the case of this blog post I’ll be comparing the visual elements of this Vogue cover created by Giorgio De Chirico to the sense of taste. To begin with the colours are cocoa, Ivory and black with some rose colours. 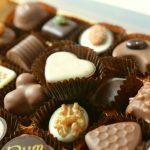 The entire palette is what one would usually see in a box of chocolates. 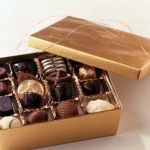 One can taste the creamy white chocolates, salted caramels, rich dark chocolates and even ones with raspberry filling. 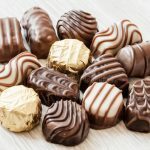 The smoothness in the texture of the items depicted in the foreground creates the taste of a good chocolate; the kind that melts and dissolves in one’s mouth. The entire image tastes sweet and rich. The idea of this being a very confectionary design is further reinforced with the line work. The squiggly lines are similar to the designs on these small chocolates. The lines on the mirror in the background create the impression of a shiny surfaced texture. This tastes like the piece of paper in which the chocolates are typically placed. Unfortunately, the paper wasn’t properly removed from the chocolate and now you are eating the pretty paper by accident. It tastes bitter. It tastes like a mistake. 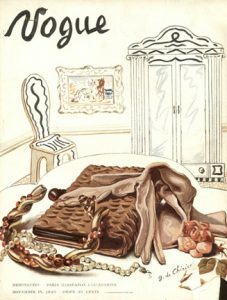 Giorgio De Chirico’s cover for Vogue brings the taste of confectionary chocolates to life, even if unintentionally, by making specific colour choices and by the lines he creates and the way it is laid out like a plate on which chocolates would be arranged on a platter. Funnily enough, the rich and luxurious taste of chocolate fits well with the contents of the pages of vogue. The loose and suggestive line work is like those found in a fashion illustration sketch. These little chocolates taste like luxury and style. Inspiration drawn from the graphic design works by Lester Beall, Paul Rand and American Magazines. AMERICAN MODERN, 1925 – 1940: DESIGN FOR A NEW AGE | The Metropolitan Museum of Art, 11 Apr. 2000, www.metmuseum.org/press/exhibitions/2000/american-modern-1925–1940-design-for-a-new-age.